Earlier this year I made the decision to go – by myself – to the BBC History Weekend in York. I cannot stress how far outside my comfort zone this was. 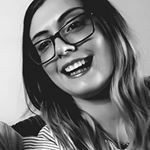 I made the decision to travel halfway across the country by myself and really put myself out there in terms of meeting history friends from Instagram. Luckily for all of us involved, none of us turned out to be mass murderers. I thought about sharing my experiences and writing a travel guide to York, but there are literally hundreds of them out there on the web already. 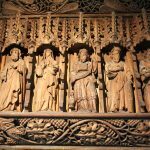 So then I decided to write an honest travel guide based around the reason I made my pilgrimage to York – the history. So here is the Hisdoryan History Travel Guide to York. Probably the number one tourist attraction in the city, York Minster is breathtakingly stunning. Unfortunately, between travel times and the limited amount of free time I had between the festival talks, I didn’t really have an opportunity to visit the Minster. If you love church architecture like me, you would need a good few hours to take it all in. I must admit a few of my York-based Instagram friends warned me that prices had recently risen and, that unless you were planning on doing the tower tour, it wasn’t really value for money. 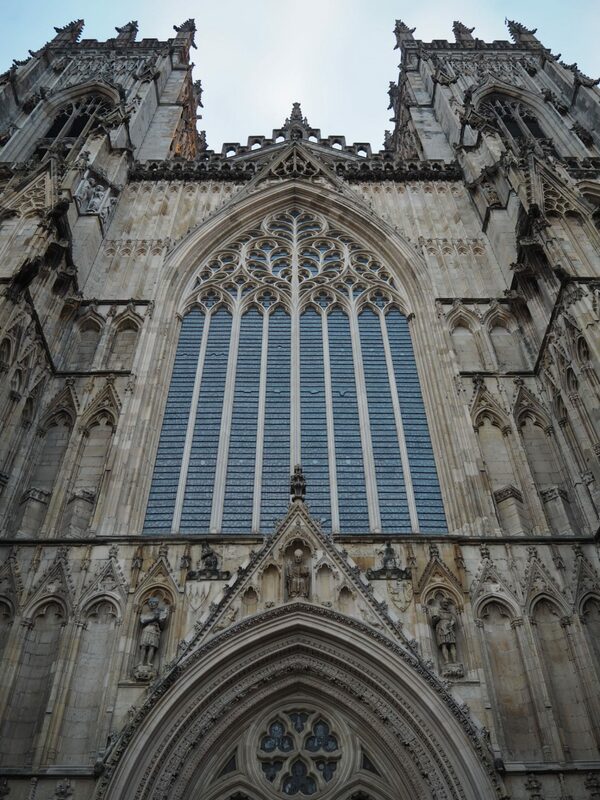 It costs £11 for entry to York Minster, rising to £16 if you want to do the tower tour. Having said that, everyone who had done the additional tower tour said it was amazing and the view from the top of the Minster were simply breathtaking. Ah, The Shambles – that iconic York destination. I made the decision to get up at the crack of dawn and visit before the hoards of tourists descended. I’m so glad I did, but it was hard work dragging myself out of bed at the crack of dawn! 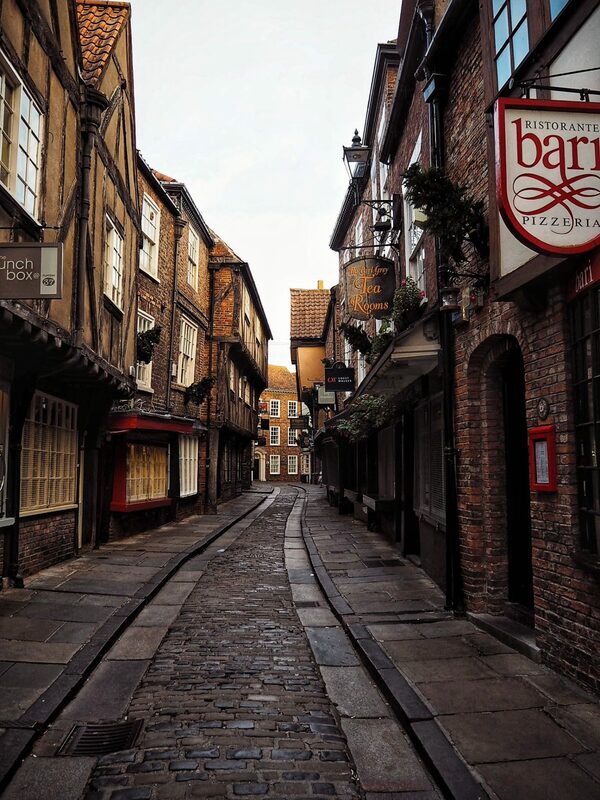 For those of you that don’t know, The Shambles is Europe’s best-preserved late medieval street. 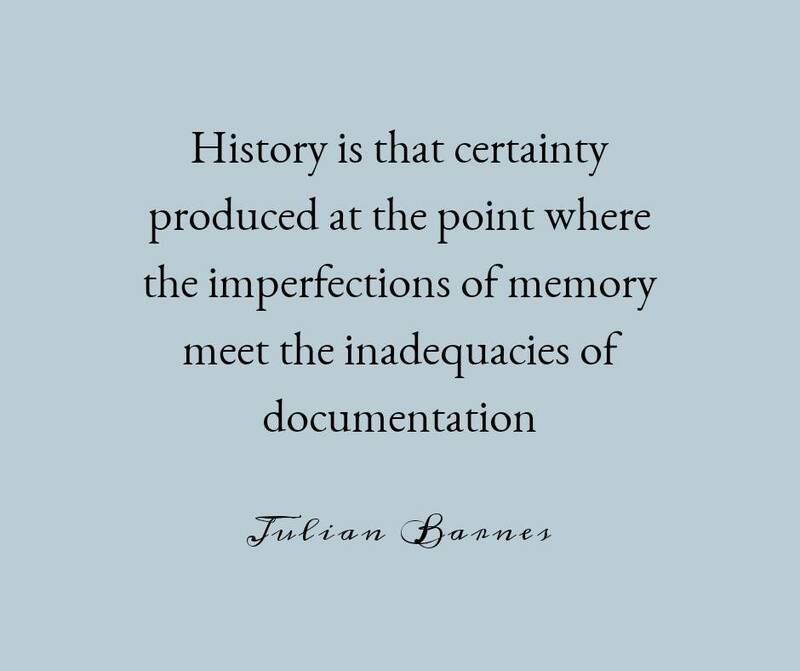 It was even recorded in the Doomsday Book. When I say visiting the Shambles is like taking a step back in time, I am not exaggerating. The overhanging timber-framed buildings and meandering lane transport you back to a different era. The name “Shambles” comes from the Saxon “Fleshammels” which means “the street of the butchers”, for it was here that the city’s butcher’s market was located. In 1872 25 butchers shops were located on this street, but now none remain (although there is a meat pie shop if that counts). A number of the shops on the street still have meat-hooks hanging outside and the large shelves on which meat would have been displayed. One of the reasons the buildings were constructed so close together was to stop the light getting into the street and making the meat go off. The filth and smell that must have been generated by this industry now seems a long way away. The Shambles can get very busy, especially at peak tourist times, so I recommend getting up early like I did if you want the place all to yourself. I was very lucky that when I visited York I had a local guide in the form of Rachel from RA Conservation. Rachel and I met via Instagram and were both looking for someone to go the BBC History Weekend with – it was fate! 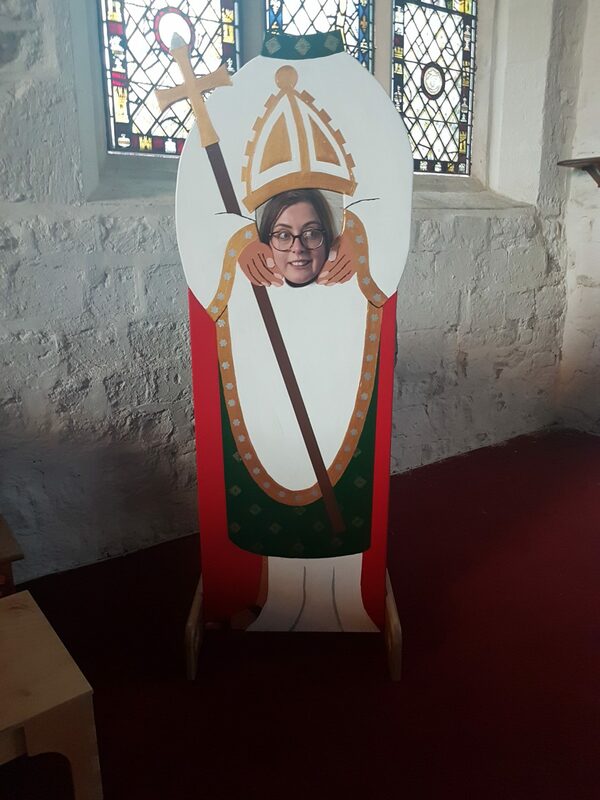 Rachel also used to volunteer for the Churches Conservation Trust, so I knew I was in good and knowledgeable hands when we decided to do a mini-tour of some of the city’s special churches. 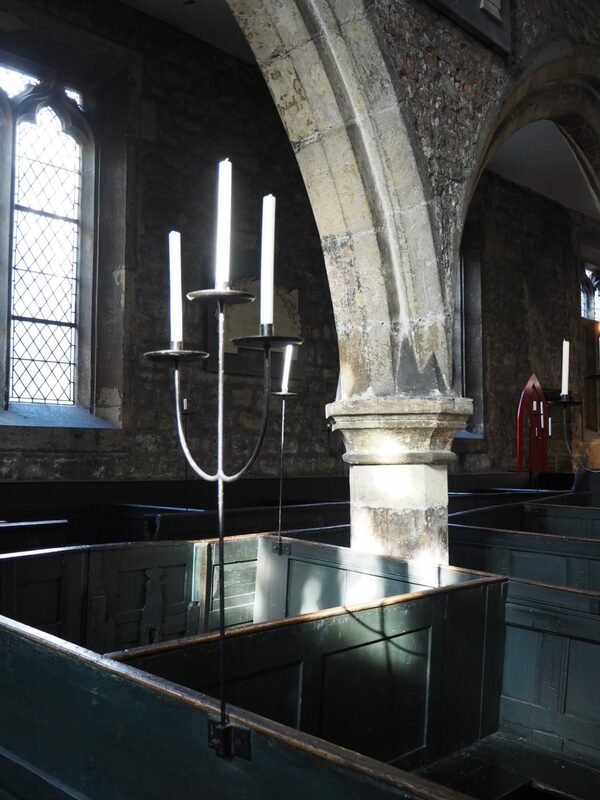 I follow Rob from Church Crawling on Instagram, and I am always bowled over by the pictures he takes of Holy Trinity Church where he volunteers for the CCT. It simply had to be our first stop on our mini church-tour of York! Its a fab little church, tucked through an archway off Goodramgate. A true oasis of peace in the middle of the city. 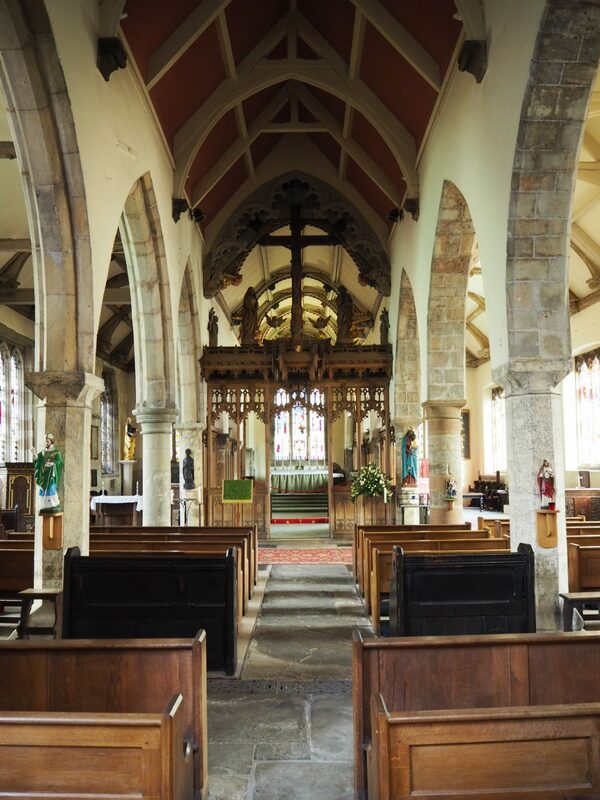 While the church building itself is still largely medieval, inside the interior is mostly Georgian, complete with original Georgian box pews. There is also no electricity in the church, so everything is bathed in the soft glow of candlelight. 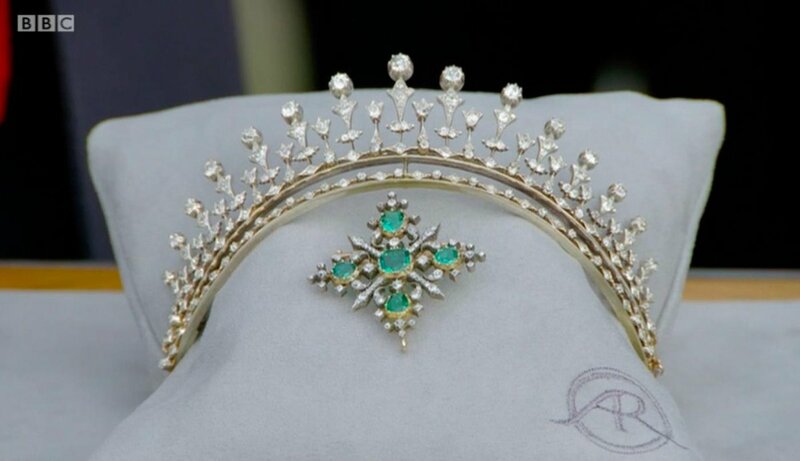 Simply magical. Holy Trinity Church is one of those places that has that indescribable special aura that makes the hairs on the back of your neck stand on end. A must-visit. 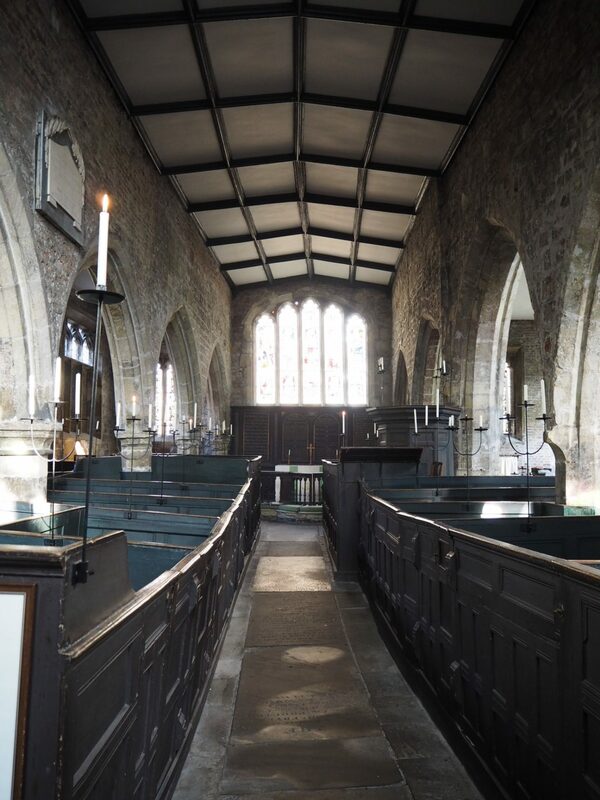 The second stop on our mini church tour was St Denys, Walmgate. It’s one of the oldest churches in York, with a Norman doorway and a simply stunning collection of medieval stained glass. 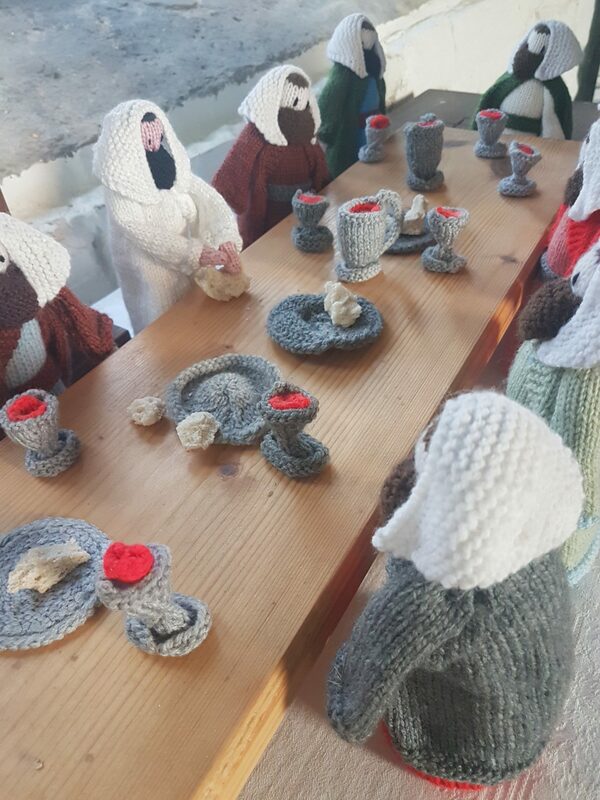 Unfortunately, me and Rachel were distracted by the rather fun interpretation, including a knitted last supper! Four our final stop we crossed the river Ouse to All Saints Church, North Street (not to be confused with All Saints, Pavement which is in the same city). 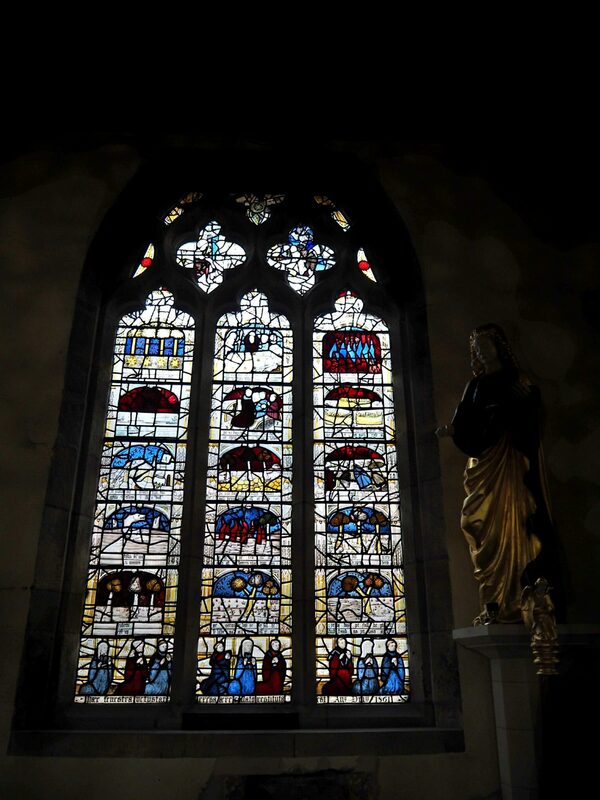 All Saints is special because it contains one of the most important displays of medieval stained glass in Britain, including the famous Pricke of Conscience window. The iconography is based on an anonymous Middle English poem all about the final fifteen days of the world, and shows images of sea monsters ruling the wives and the earth setting alight. Even the name of it makes you excited, doesn’t it? The Merchant Adventures Hall conjures up images of 16th Century seafarers exploring new worlds. In reality, the truth was a bit less exciting (A merchant adventurer was someone who risked or ‘adventured’ their own money in overseas trade bringing back goods and wealth to York) but the beautiful building more than makes up for it. 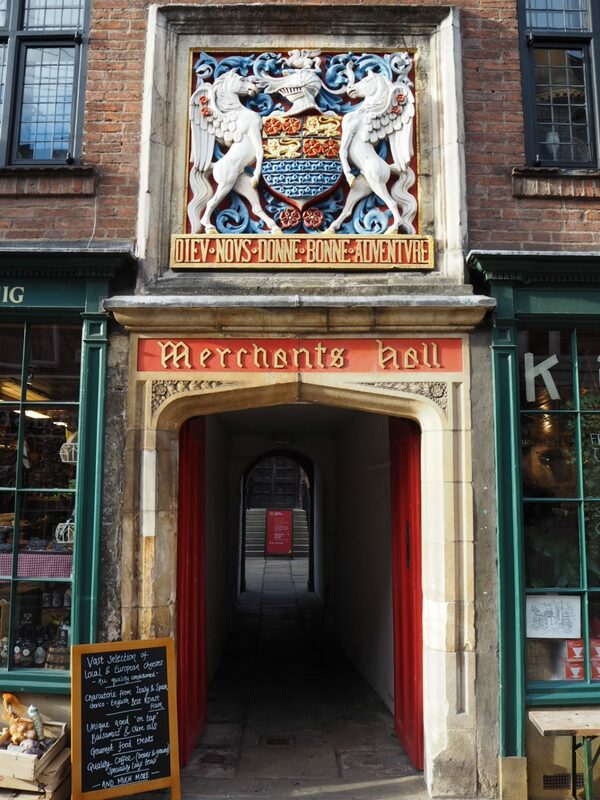 The Merchant Adventurers Hall is one of the finest remaining examples of a medieval guildhall still in existence in Britain, and would have been one of the most important buildings in medieval York. 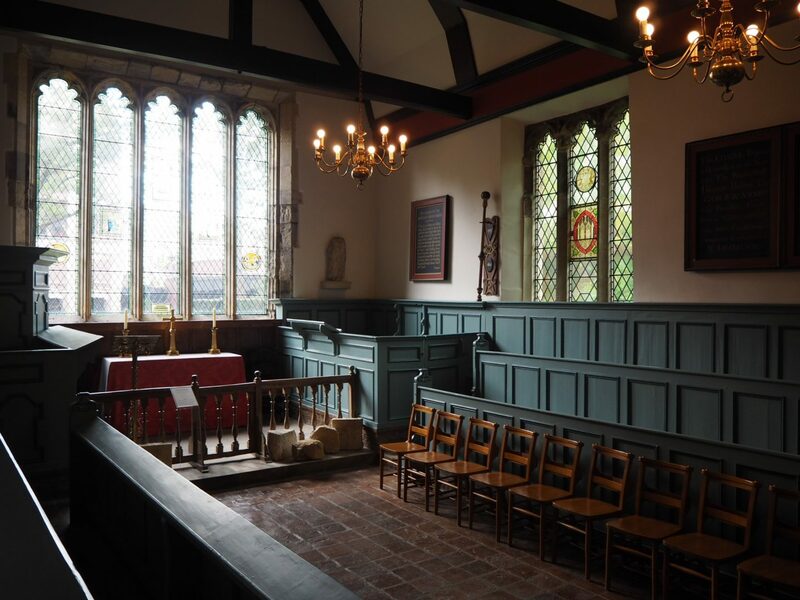 The ground floor principally consists of an under croft and church, and upstairs you will find the Great Hall. 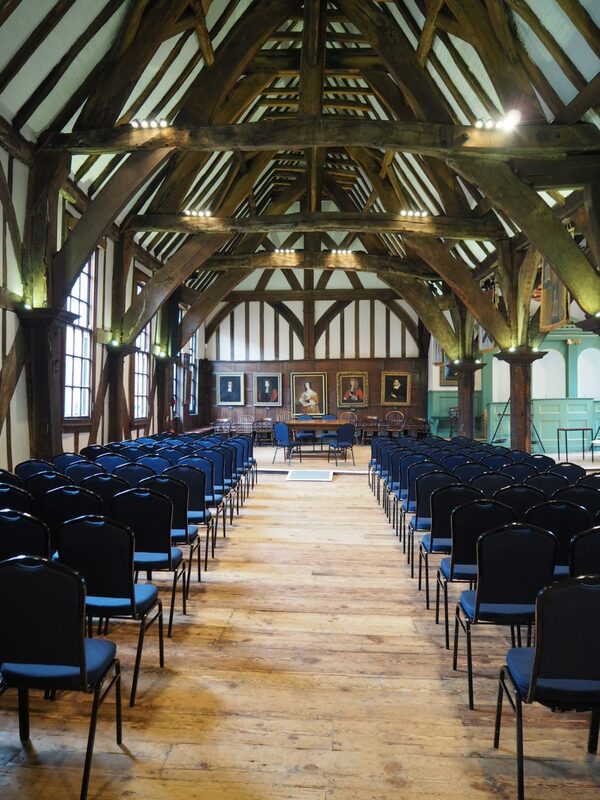 The Great Hall is the largest timber-framed building in the UK still standing and used for its original purpose. Unfortunately when I visited they were preparing the hall for a wedding. All the trestle tables spoiled the overall effect, but I do understand that heritage attractions need to make money. 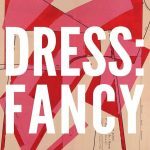 Entry is £6.50 for adults and includes a free audio tour. I paid £3 for a guide book (as I collect them) but it wasn’t very substantial and not worth the money in my opinion. Like I’ve already mentioned, I didn’t have tons of free time, so I did miss out on some attractions that were on my short list. These included Fairfax House and Treasurer’s House. Fairfax House is a gorgeous Georgian townhouse, built in the 1740s, and acquired in 1759 by Viscount Fairfax as a gift for his daughter Anne. 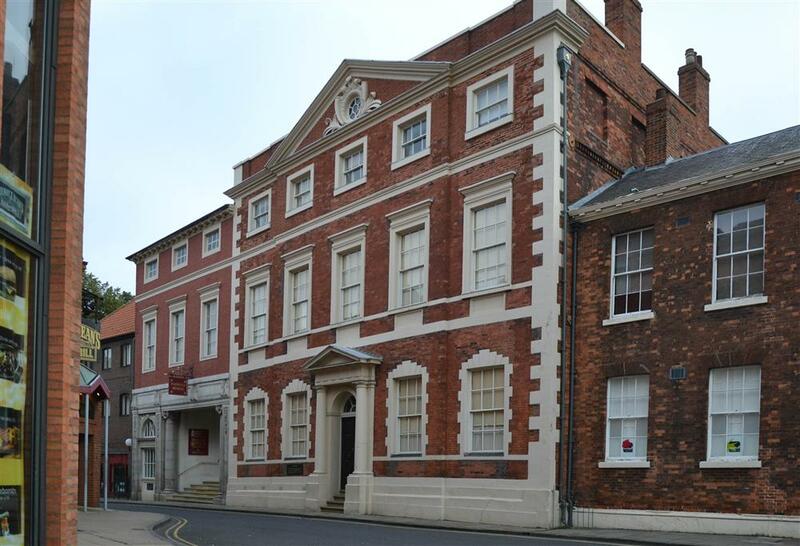 Standing on Castlegate, Fairfax House was at the centre of York’s polite society, The original Georgian interiors were restored in the 1980s and the whole place is an immersive 18th Century experience. 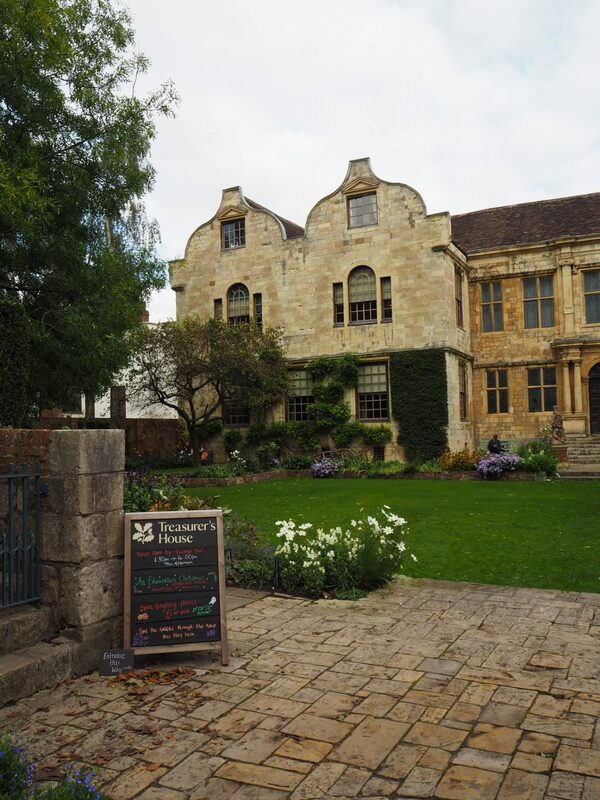 Treasurer’s House is a veritable haven, tucked away behind the Minster. An elegant townhouse dating from medieval times (it was originally built for the city’s treasurer funnily enough! ), Treasurer’s House was the first house ever given to the National Trust with a collection. It’s also reputedly home to several ghosts, including a ghostly battalion of Roman soldiers in the cellar! There was no consensus amongst my York-based Instagram friends on the topic of Fairfax House vs. Treasurer’s House. I would point out though that the entry fee to Fairfax House is a tad cheaper than Treasurer’s House (£7.50 vs. £9). I would also point out that my history travel guide to York features my top pick of historical attractions in the city, but there are many, many more I haven’t featured. The two days I had in York simply wasn’t enough time to do it justice. I had a brilliant time, made some amazing new friends and would definitely go back again. Have you visited York? What were your favourite places to visit? house to the left of the churchyard entrance) It was the Bell Inn then. 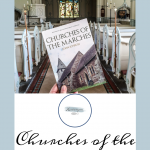 your visit to the Cwmdauddwr Churchyard and the box grave of Major Edward Jones. computer I would be more than happy to share it with you. Hi Roger. Great to hear from you. I would love to share info! We have just started a local history group up in Rhayader (we literally had the first meeting last night) so I would love to hear all your stories. Would you be able to email me on hisdoryan@gmail.com ?